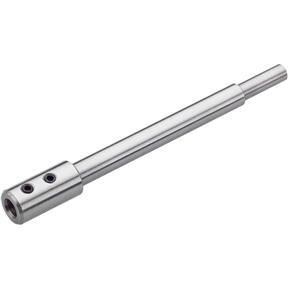 Extend drill bit lengths by 5-1/2". For all 3/8" and stepped 3/8" round shank drill bits. Two set screws lock drill bits securely in place. Measures 6-7/8" overall. Bought this drill bit extender to use for making pepper mills on my work lathe. It is well made and machined with precision. It's the best one I could find. Works as intended. Works as intended. Works as intended.